Color photography was introduced to the world prior to the 20th century, but even by the WW2-era, black-and-white photography was still the norm. Although color photos were not extremely rare, they came few and far in between. The result was that, since we typically expect WW2-era photos to be in shades of gray, the impact of those in color was far greater on the viewers. With nearly 7,000 photographs in the WW2DB collection at the time of this writing, I compiled a list of ten interesting color photographs from the WW2-era for your enjoyment. What do you think? Be sure to leave a comment and let me know. This photo of battleship USS Arizona erupted in an explosion is arguably one of the most memorable photographs from the Pearl Harbor attack. German Panzer III medium tank driving across desert terrain in North Africa. An anonymous American welder building warship boilers in a Tennessee, United States factory. American M3 medium tank in exercise in the United States on a beautiful sunny day. B-25 Mitchell bombers being assembled in Kansas, United States. 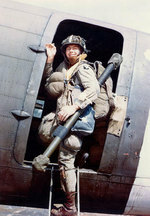 US 101st Airborne Division paratrooper posed for this photograph while boarding a C-47 aircraft to rehearse for the Normandy invasion. 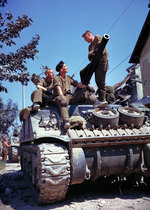 Canadian tankers and their Sherman tank in Normandy, France. Crew of a 30 caliber machine gun watched as American troops landed on the invasion beaches at Iwo Jima. US 101st Airborne Division glider troops taking a moment to relax after the end of the European War. The end of WW2 in color: the Japanese delegation arriving board battleship USS Missouri in Tokyo Bay for the surrender ceremony. Did you enjoy this collection? 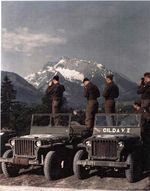 You may wish to check out the other photographs in the WW2 in Color photo gallery and the general WW2 photo gallery. Really loved it? Please consider sharing this page with others using the "Share this article with your friends" links below, thanks! P-51B Mustang “Ding Hao!” and Maj James Howard (in cap) of the 356th Fighter Squadron at RAF Boxted, Essex, England, UK; early 1944. See Comment below. "Since peace is now beyond hope, we can but fight to the end."